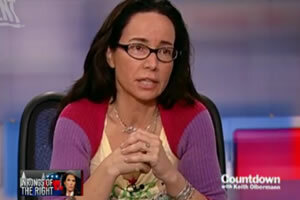 Actress-comedian Janeane Garofalo has joined the chorus of celebrities suggesting Minnesota Rep. Michele Bachmann's husband, Marcus, is gay. Garofalo made her remarks during a recent appearance on Countdown (now on Current TV). Mr. Bachmann's Christian counseling clinic has been accused of practicing “reparative” therapy, a discredited pseudo-science that aims to turn gay people straight through mostly religious means. Bachmann has denied the claims. “He seems to be quite gay to me,” Garofalo told host Keith Olbermann. In a comedy skit that included guest star Jerry Seinfeld, The Daily Show's Jon Stewart attempted to resist cheap Marcus Bachmann gay jokes. In the end, neither could resist. And in his latest podcast, gay activists Dan Savage also questioned Marcus Bachmann's sexuality.